Quick Menu.... About Us and home page Index of our Bichons Our friends and favorite links Puppy Inquiry form Our latest news Pictures of our current litter What is Flamenco? Craigdale ......began in 1975 the day my 13 year old son, Craig, brought home his own birthday present.....a Bichon Frise puppy named Heidi. Craig went to Junior handling classes and before we knew it we were hooked! Craig showed his Bichon to her Canadian Championship, accumulating along the way a Group 4, as well as a Best Puppy in Group! It was at this time I first met Pauline Brock, Hon. Sec. of the Bichon Frise Club of Great Britain, who was visiting her daughter in Vancouver and had heard there was a litter of Bichons in the area. Needless to say, being both new in the breed, we had hours of talking to do. In 1977 I went to my first BFCA National Specialty and learned so very much about the pedigrees and background of many dogs. As I look back today, I believe that the best learning tool is to go to a National Specialty and study the producing lines, especially in the puppy classes. 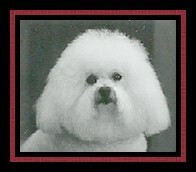 Was one of the founding members of the Bichon Frise Club of Canada in 1979. From 1987 to 1988 I was honoured to serve as President of the Bichon Frise Club of Canada and remain today as a Director. In the 27 years since I was introduced to this wonderful breed the Bichon Frise, the most dear to my heart memories are the wonderful Friends I have met along the way, of who without the help of, many of my " Memorable Moments" would not be. ..And it all started with a Bichon puppy named "Heidi"